The AprioMed 2D medical animation was produced in 2016 to introduce the Moorison Steerable Needle™ at an upcoming trade show. AprioMed had an upcoming trade show in which it needed to introduce the Moorison® Steerable Needle in a clear and concise way. They turned to MVP to get it done right and on time, needing to move from start to final video in a tight four week period. 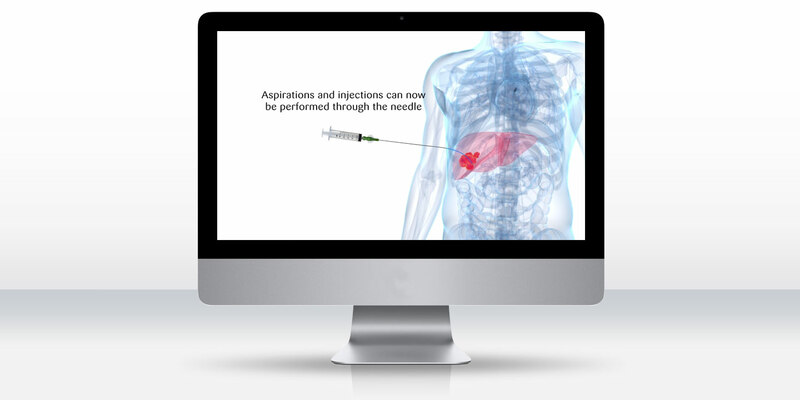 The new trade show video would feature 2D medical animation to demonstrate the unqiue selling points of the Moorison Steerable Needle. This advanced needle is used in interventional radiology to precisely target biological structures at exact points for a given procedure, without affecting any of the sensitive biological structures around the site. MVP worked with the client to outline the steps of the procedural animation, which moves from superficial injection and curvature of needle to insertion into targeted tissues and removal of the guidance apparatus fos use of device in injection, apirations, and biopsies. The video begins with close-up shots of the Moorison Steerable Needle, with animations of its basic mechanism of action along with some background information. MVP used a transluscent human body with a red highlighted liver and tumor mass to illustrate the use of the Moorison Steerable Needle. The needle animates onto the body and follows the procedural steps to demonstrate clinical use of the device. The final video was formatted in high resolution with background music integrated, and was displayed at the trade show on large widescreen monitors. The medical animation proved to be a success at the trade show, earning the client's enthusiastic endorsement: "We love it!"